The event that so many investors dread is an oft-misunderstood gift. It's rare that Wall Street analysts say anything meaningful for everyday investors, but a recent CNBC interview with Morgan Stanley analyst Mike Wilson could be an exception. In it, he argued that a dreaded bear market -- when stock indices like the S&P 500 fall at least 20% -- is already here. While that sounds scary, it's actually great news for investors and is a situation to be embraced. I think we're in a rolling bear market. Every sector has gone down at least 11 or 12 percent at least once this year. Some were down 18, 19, 20 percent. It's fooling everybody at the index level, but there's a lot of pain out there. 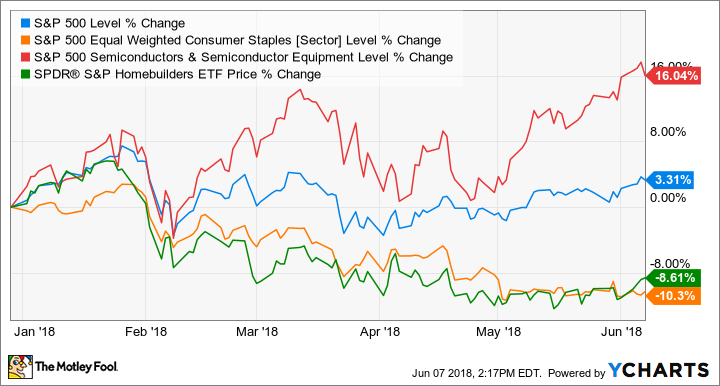 Staples, homebuilders, some of these semiconductor stocks that are more cyclical are having problems, but some are doing really well. So it's a mixed bag, it's not everything going down at once. What does that mean? While the S&P 500 index is off its January all-time highs, it is still sporting a low single-digit gain for the year. That number can be misleading, though, as some industries are still lagging. The pain is being hidden by sectors that have rebounded, like semiconductors, as you can see below. In particular, high-flying tech giants Facebook, Apple, Amazon, and Google parent Alphabet have grown to account for 12% of the entire S&P 500 index, giving them an outsize bearing on the perceived performance of the stock market overall. The reason for some business stress is that wages, operating expenses, and business investments are increasing. That's great for long-term growth, but it's a short-term drag on the bottom line. Investors, taken collectively, have always been a shortsighted bunch, and lapping the prior year's profits has always been priority No. 1. Boosted by corporate tax cuts passed in December, profitability in 2018 could be tough to top in 2019 with those higher expenses on employees and investing for the next wave of growth. Thus, Wilson's argument that a "rolling bear market" is already underway and that it could last through the end of 2019. None of this is to say that a traditional bear market won't occur; it happens sometimes, triggered by an event that causes mass investor panic. In a closer-to-perfect world, though, that doesn't happen. There are always sectors of the economy that outperform and others that lag. I have argued that the market pullback in 2015 through early 2016 was this kind of bear market for the same reason, with broad-based pain masked by low interest rates fueling share buybacks, and outperformance in big technology names. What that requires of investors is to stop getting hung up by the performance of stock market indices and to start thinking more like a business owner. As a shareholder, that's exactly what you are. Understand that sometimes the companies you own go through a rough patch; sometimes many of them do so all at once. Rather than panic, it's important to try to ascertain what is causing the pain. In some cases, paying employees more and spending money on future growth initiatives is the cause of short-term uncertainty. Yet that's also a great opportunity to invest in companies that are being smart by already gearing up for the next cycle of expansion -- companies that have the potential to reshape the entire economy. When viewed in that light, bear markets aren't anything to dread at all. Instead, they are a normal part of being a business owner -- even a favorable occasion. If the next bear market -- marked by increased volatility and individual company and industry bleeding -- has in fact begun, love the volatility and get ready to use it to your advantage.